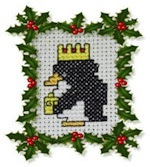 Ready to try a free cross stitch pattern? If you've digested the information on my beginners page, then you're probably keen to stitch your first real design. 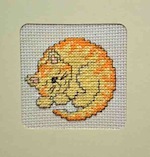 Before you go ahead and browse my cross stitch design catalog you might like to try a freebie, as a gift from me. 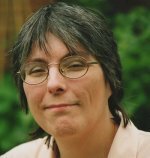 This will give you a chance to try out my charts to make sure you can follow them easily. It will also give me a chance to say thank you for visiting my site today. 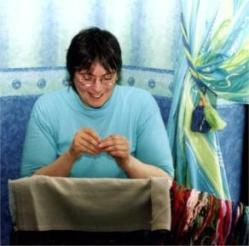 All you will need is some basic supplies, cross stitch fabric, a needle and maybe a hoop. You might also like to see how to mount your free cross stitch pattern in an aperture card when its finished. Click here for instructions. 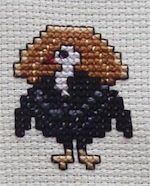 There are also other types of free embroidery designs throughout the site. Clicking on the link above will take you to a list of those also. Please feel free to use these charts to introduce a friend to cross stitch. 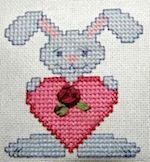 I am also happy for you to link to the free cross stitch pattern pages so that others can find them. Please respect my copyright and do not copy my page and then add it to your own Web site. All pages on this site are protected by Copyscape and I will be alerted if you do that, and would have to ask you politely to remove them.